Cinema has always been adept at conveying truths that we can’t quite articulate in everyday life. Our feelings tend to be less baffling when contextualized by our surrounding reality, which is quite often taken for granted. It’s not uncommon in Georgian society for generations of family members to live together in the same space, inhabiting their roles as parents and children long after they have outgrown them. Whereas women have to prove themselves on a daily basis, men can get away with practically anything, save for physical abuse or excessive drinking. It is the woman’s duty, above all, to maintain the happiness of her family through her peaceful and self-sacrificing nature. No wonder Manana (Ia Shugliashvili), the 52-year-old heroine of Nana Ekvtimishvili and Simon Gross’ “My Happy Family,” cannot wait to escape. Even before the film’s initial fade-in, Manana has been silently entertaining the notion of moving away. The first scene follows her on a tour of the apartment where she will eventually move alone, much to the utter bewilderment of her family. Time and again, Manana is asked whether she had been struck by her husband, Soso (Merab Ninidze). Surely she must’ve been hurt in order for such drastic measures to be taken. “I won’t explain it to anyone,” insists Manana, while assuring them that she was not a victim of violence. Perhaps she truly believes this to be the case, since the abuse she has suffered has been of a much more insidious variety. Though her disapproving loved ones insist that their actions are made out of love, they stem from a deep-seated need for control. Manana is expected to suppress her own needs even while she’s being celebrated on her birthday. So determined is Soso to keep up the strained image of his family’s contentment that he invites numerous guests to her birthday party, despite the fact that his wife had explicitly asked for a quiet evening at home. As soon as crowds stream through the door, Manana snaps on the cheery façade of a dutiful host until they are no longer in view, allowing her face to collapse in exhaustion. This endless night turns out to be the final straw, though it’s not until she returns to her day job as a teacher that she acquires the bravery to act on her desires. When she asks a 17-year-old student, Tatia (Lika Babluani), why she has missed so many classes, the young woman informs her that she was divorcing her husband. It wasn’t a result of abuse—they simply wanted different things—but Tatia cautions Manana that as soon as she makes up her mind about what she wants in life, she must commit to that decision. Otherwise, she will forever remain a prisoner. It’s a sublime instance of a student offering her teacher a much-needed lesson that never feels patronizing, and that is in part due to the inspired casting of Babluani. She made her astonishing screen debut in Ekvtimishvili and Gross’ first co-directorial effort, 2013’s “In Bloom,” a film that serves as a fitting companion piece to “My Happy Mother.” Set in 1992, a year after Georgia received its independence from the Soviet Union, “In Bloom” centered on Eka (Babluani), a teenager distressed by the man aggressively pursuing her close friend, Natia (Marian Bokeria). After he and his pals grab Natia against her will and drive off with her in a car, Eka hurls expletives at a crowd of indifferent witnesses until an old man socks her in the face. This leads to one of the most exhilarating sequences I’ve ever seen, in which Eka—her face freshly bruised and her movement loosened by alcohol—performs a mesmerizing dance at Natia’s wedding, affirming that she will remain a force of strength in her friend’s life regardless of her concerns. 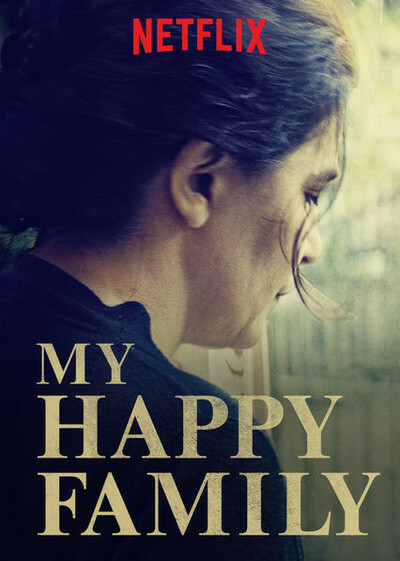 “In Bloom” quickly grew to become one of my all-time favorite films, and “My Happy Family” is every bit as enthralling and masterful an achievement. Both pictures were lensed by a cinematographer who previously worked with Romanian auteur Cristian Mungiu on his similarly claustrophobic portraits of oppressive societal strictures. Like Mungiu, Ekvtimishvili and Gross favor staging scenes in meticulously choreographed extended takes that fully immerse us in the character’s oft-cramped surroundings. Whereas DP Oleg Mutu (“4 Months, 3 Weeks and 2 Days”) infused “In Bloom” with a sense of impending menace, Tudor Vladimir Panduru (“Graduation”) accentuates the poignance of various moments in “My Happy Family” with his equally accomplished cinematography. Consider the scene where Manana enters a family’s apartment, posing as a gas meter reader. The shot begins over her shoulder as her eyes lock with the boy who answers the door, but only gradually do we realize the child’s identity. By the scene’s end, the framing has flipped, causing us to peer over the boys’ shoulder at Manana, whose carefully modulated expression now speaks volumes. Nearly every scene is anchored by Shugliashvili’s face, which unceasingly fills in the blanks intentionally left by Ekvtimishvili’s deftly nuanced dialogue. After a wrenching revelation is casually thrust upon Manana at a class reunion, the camera slowly pulls in toward Shugliashvili, as the implications of this newfound knowledge swiftly deflate her lighthearted demeanor. When she reluctantly complies to her friends’ request that she serenade them, Manana’s pent-up grief spills forth in the guise of melodic poetry, bringing down the house not unlike Eka’s dance. One of the universal truths explored by “In Bloom” and “My Happy Family” is the extent to which an all-too tight-knit family can stunt one’s own personal growth. When Manana is finally freed from her inattentive husband, grown children and judgmental parents, the calming emptiness of her new apartment is intoxicating. After moving tirelessly through the confines of Manana’s familial entrapment, the camera is able to linger for several glorious beats on the heroine sitting next to her balcony, eating a slice of cake as Mozart’s infamous piano sonata accompanies the serene gusts of wind billowing through a nearby tree. Yet even this oasis isn’t entirely unhindered by patriarchal oversight, thanks to Manana’s brother, who paid a couple of local thugs to guard his sister from afar—not to keep her safe, but to keep her in line. Many of the year’s best films feature female protagonists who are resolved to live on their own terms, and “My Happy Family” ranks right alongside them. It deserves to not get lost in the awards season hysteria, and when viewers stream it on Netflix, I recommend that they couple it with “In Bloom,” which is available for rental on DVD. Together, they form one of the finest double bills in recent memory.